For your convenience, you may arrive as early as you like before 4:00 PM on your arrival date, and use the common areas on the Siesta Breakers property (tennis courts, pools, lounges and chairs, private beach area, and restrooms), until you can access Siesta Breakers #603. You may also stay as late as you like after 10:00 AM on your departure date, and use the common areas on the Siesta Breakers property. Just be sure to park your vehicle in one of the visitor parking spots in front of the rental office, and not in the Siesta Breakers #603 reserved parking spot. Your unit key will open the restrooms in the pool area, as well as the tennis court gate, and you will have the access code for the security gates. The traveler will not get a refund if they cancel their booking at any time after it is accepted. In the event of severe weather conditions (hurricanes, tropical storms, and tornados), red tide or similar poor water conditions, or any other acts of nature, COMPENSATION OR RESCHEDULING OF RENTAL ARE NOT OFFERED. Under Florida law, establishments are not required to issue refunds for prepaid reservations unless rental cancellation terms state otherwise. In the event that the unit becomes unavailable or uninhabitable due to naturally occurring events or entities, such as severe weather conditions (hurricanes, tropical storms, and tornados), and mandatory evacuations, COMPENSATION OR RESCHEDULING OF RENTAL ARE NOT OFFERED to non-arrivals or for early departures. Any deposits and pre-paid rent will not be refundable, so it is highly recommended that travel/trip cancellation insurance is purchased to cover financial losses from cancellations. Officially the Atlantic Hurricane season is June 1 to November 30th. However, the most probable time for hurricanes is from mid-September to mid-October. In the event that during your stay there is an occurrence of red tide, or red tide is present upon arrival, COMPENSATION OR RESCHEDULING OF RENTAL ARE NOT OFFERED to non-arrivals or for early departures. No compensation or rescheduling of rental are offered for the inconvenience of red tide or similar poor water conditions on Crescent Beach in Siesta Key, or the surrounding areas. Connection is available in the pool area. Other people might be able to see information that you send over this network if you do not have a VPN service. Siesta Breakers #603 is a Gulf Side Beach Condo, 6th Floor, with a Gulf of Mexico, Crescent Beach & Pool Area View from a spacious Screened Lanai, and with all Gulf Side Beach Amenities Access at Siesta Breakers resort condominiums (north building), in Siesta Key, FL, located directly at the end of Stickney Point Road where it intersects with the main thoroughfare, Midnight Pass Road, offering easy access onto and off this increasingly popular tourist destination, an 8 miles long barrier island just offshore of Sarasota, with the Intra-Coastal Waterway of Roberts Bay and Little Sarasota Bay on the east side, and the azure waters of the Gulf of Mexico and Crescent Beach on the west side, with some of the most beautiful, soft, pristine white quartz sand in the world. This ideal location also puts Siesta Breakers in the center of Crescent Beach, and for your added convenience, near 3 Shopping Centers within walking distance, a full service grocery store with a deli counter offering both hot and cold foods directly across the street, a nearby drug store with a post office and PC's available, a courier service, an assortment of stores, shops, boutiques, and salons, a liquor store, fine restaurants and entertainment, and seafood houses, even a marina with boat, kayak, jet-ski, scooter, scooter car, and bike rentals, and fishing and para-sailing charters also available. The Siesta Breakers #603 living room opens through 14 foot, floor to ceiling impact glass doors onto a screened lanai with a View of the Pool Area, Crescent Beach and the sparkling aqua blue waters of the Gulf of Mexico. The master bedroom also opens onto the screened lanai, through 5 foot glass impact doors. Enjoy the balmy breeze from the lanai with a spectacular view of the gulf, surrounded by lush tropical greenery. You see a view of the Gulf of Mexico and Crescent Beach as soon as you enter the front door, reflected in 15 feet of floor to ceiling mirrors on the living room wall. Guests have complete access to all Siesta Breakers property amenities, including a large heated pool, an outdoor shower, 2 tennis courts (night play available on both), clubhouse, and a private beach area (250 feet from the condo), complete with beach lounges, and chairs. The property has paver brick driveways, and parking lot, with reserved covered parking for your vehicle, and a gas barbecues available by the tennis courts. Beach access is along a walkway, just minutes to a private piece of the crystal sands of Crescent Beach. Complimentary Siesta Breakers WiFi is available in the pool area. 1) Excellent “All-In Price” Discounted Rental Rates offered to Guests. 2) Super accommodation Cost Savings received by Guests. 3) Comprehensive Arrival & Departure Information Package provided to guests 30 days prior to their arrival to give an advance opportunity for guests to begin planning their Florida sun vacation activities. 4) Area conveniences available within a few blocks walking distance from Siesta Breakers #603 because of the Central Location of the Siesta Breakers property on Crescent Beach, consisting of 18 assorted restaurants, cafés and eateries, 8 rental businesses, 2 liquor stores, 4 shops, 2 salons, grocery store, convenience store, real estate agent, bank, drug store, post office, florist, and a courier service. 5) Resort Amenities available to Guests at Siesta Breakers. 6) Ease of Access to and from the Siesta Breakers property. 7) Siesta Breakers is a Gated Property with a security access code required for vehicle entry, and pedestrian entry from the street, and from the beach. 8) Complimentary Poolside WiFi is available to guests at Siesta Breakers. 9) Wheelchair Access to the pool area & Crescent Beach. 10) Siesta Breakers has a Power Failure Generator which will switch on during a power failure, and maintain lighting and elevator operation only. You must turn off the A/C during a power failure, and must not use the stove or the dryer. It’s all here at Siesta Breakers in Siesta Key, the elegant gulf side beach vacation condominium, that combines luxurious amenities with a relaxed island vibe that appeals to both visitors and locals, a place to lay back and relax, and let the warm breezes, cool water, and soft sand transport you to your personal paradise. Siesta Key is alive with laid-back tropical atmosphere, and has everything you want for a restful visit to rejuvenate or for the rest of your life! Siesta Key is a crescent shaped, eight-mile long barrier island about 50 miles south of Tampa, just offshore of Sarasota, and directly on the Gulf of Mexico, and home to some of the most beautiful soft pristine white sand beaches in the world. From one end of the island to the other, you will experience a vibrant island lifestyle, and wherever you go and whatever you do in Siesta Key, you will experience the warm welcome and island hospitality that brings people to Siesta Key and calls them back year after year. Siesta Key offers a unique ambiance for visitors and residents alike, a destination for all who stay or live in the Sarasota area, thanks to the the world’s finest white sand beaches, resorts, shopping, nightlife, a wide variety of live entertainment and unique dining options that stretch the entire length of the island, and the delicious cuisine of an assortment of American, French, Italian, and Oriental restaurants. Siesta Key has three wonderful beaches, where you can play, relax, or walk along the water's edge, Crescent Beach, Siesta Beach (public), and Turtle Beach (public). Unlike the sand on beaches elsewhere that are made up mostly of coral, the sand on Crescent Beach, and Siesta Beach is 99% pure quartz, pulverized to a fine white powder. Even on the hottest days, the sand is so reflective that it feels soft and relatively cool to the touch, no matter how high the temperature rises. Enjoy a refreshing swim in the pool, test your tennis game, play a game of beach volleyball, ride a bike, fly a kite, or just do whatever you want to do. The weather in Siesta Key is truly exceptional, an almost-perfect year round warm subtropical climate, making every sort of outdoor activity available and enjoyable nearly year-round. Once you discover how wonderful Siesta Key is, you'll want to be here as much as you possibly can. Enjoy the many outdoor activities, such as fishing, searching for shells, para-sailing, sail-boarding, boating, kayaking, snorkeling, scuba diving, bicycling, roller-blading, build sand castles, sunbathe and soak up the warm afternoon sunshine, plunge into the sparkling aqua blue Gulf of Mexico, or just walk the beach dipping your toes in the surf. As you walk along Crescent Beach, enjoy the sunshine and tropical breezes, track the flight of a flock of pelicans, see egrets, sandpipers, ospreys, seagulls and the many other shore birds, including terns, plovers, ibis, spoonbills, and storks. Bird watching is one of the favorite activities of residents and visitors alike. The many varieties of wading birds, like the beautiful snowy egret, the great heron, and the 4 to 5 foot tall Sandhill Cranes with their bright red heads and distinctive calling sounds, are just a few of the different types to be seen. Offshore, dolphins and manatees are often spotted frolicking in the gulf and bay waters. Enjoy your holiday in the Florida sunshine relaxing on a private piece of world famous Crescent Beach with silky white quartz sands. Twenty golf courses are nearby if that is your choice of leisure. The tropical climate on Siesta Key offers you rest, relaxation and recreation. Miles of beach, plus salt air and gentle breezes from the Gulf of Mexico add up to a dream vacation. Find a comfortable spot in the late afternoon to view the breathe taking moment when the sun dips below the horizon and paints the sky in strokes of red and orange. Siesta Breakers is located directly at the end of Stickney Point Road where it intersects with Midnight Pass Road, offering easy access onto and off the key . View of Gulf of Mexico, Crescent Beach & pool area from lanai. Central air and ceiling fans in master bedroom, guest bedroom & living room. Bed sheets, pillows, pillow cases & blankets. Dryer is in the unit. Complimentary Siesta Breakers WiFi: Connection is available in the pool area. Other people might be able to see information that you send over this network if you do not have a VPN service. Living room & master bedroom with Xfinity cable. Certainly enjoyed #603. Unit was adequately equipped and everything worked. The unit was clean and well located, especially being on the top floor. I would suggest that a bigger TV be installed in the LR. Awesome time as usual - returning guest. Can’t beat the rate! Vic is great to work with and unit is nice. Love the complex and area. You won’t find a better deal! Great condo! Close to Beach, shopping and entertainment! We thoroughly enjoyed our stay at Unit #603 at Siesta Breakers. The unit was clean and had everything we needed to enjoy our stay. The beach is only a minute away and had plenty of chairs. Vic sent all the info we needed and we really enjoyed our first visit to Siesta Key! I visit Siesta Key many times each year and continue to go back to Unit 603! You will never find a better deal. Right on the beach - a view and beautiful complex. Unit is clean and well maintained. 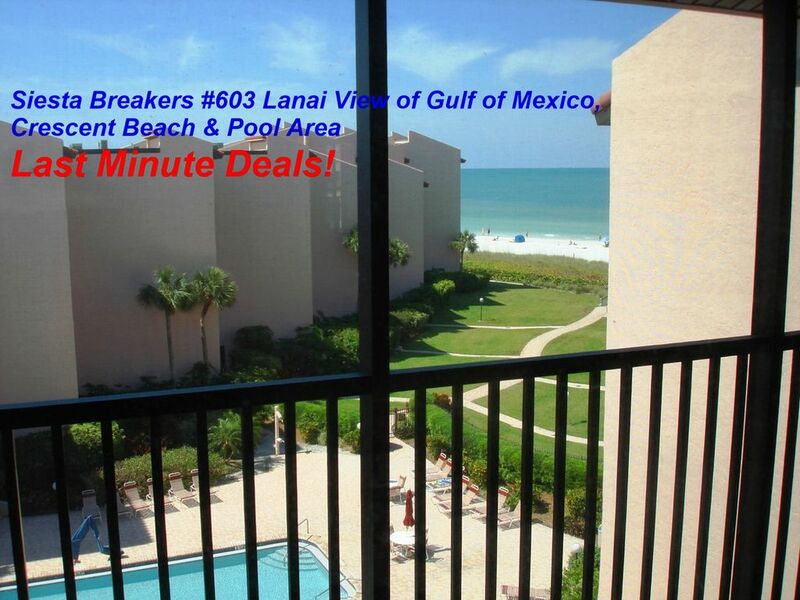 Love the location, love the beach, and I love Seista Breakers! Condo was well appointed, clean and spacious. Vic is very professional and responsive. If you're looking for a laid back and relaxing vacation then this is the place to stay. Located near a grocery store, restaurants, tikibar and so much more without the crowds you find in the Village. 4 stars because of a shortage of beach chairs - had to be out to the beach by 8 am to make sure we had 4. Otherwise, this place is perfect!! Can't wait til next year. FULL WEEK RENTALS ONLY (Saturday to Saturday only).